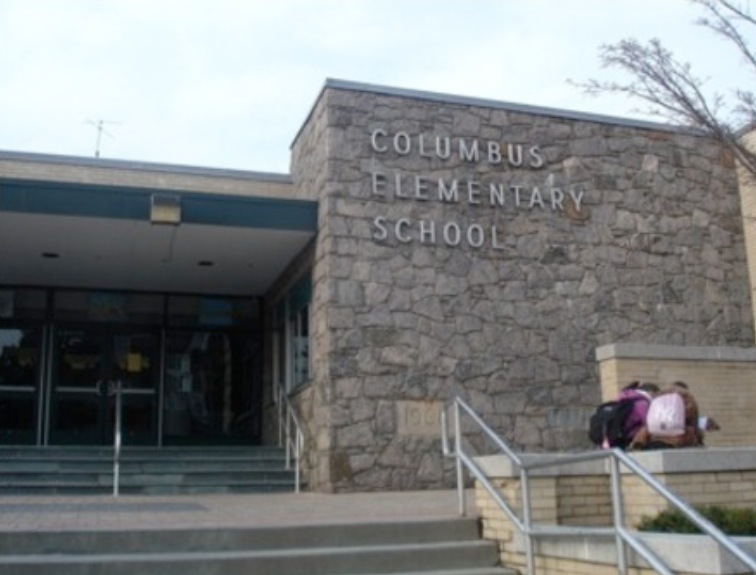 NEW ROCHELLE, NY — The City School District of New Rochelle spent $7,340.90 to make minor repairs to a brick wall at Columbus Elementary School, according to District financial records obtained under a Freedom of Information request. 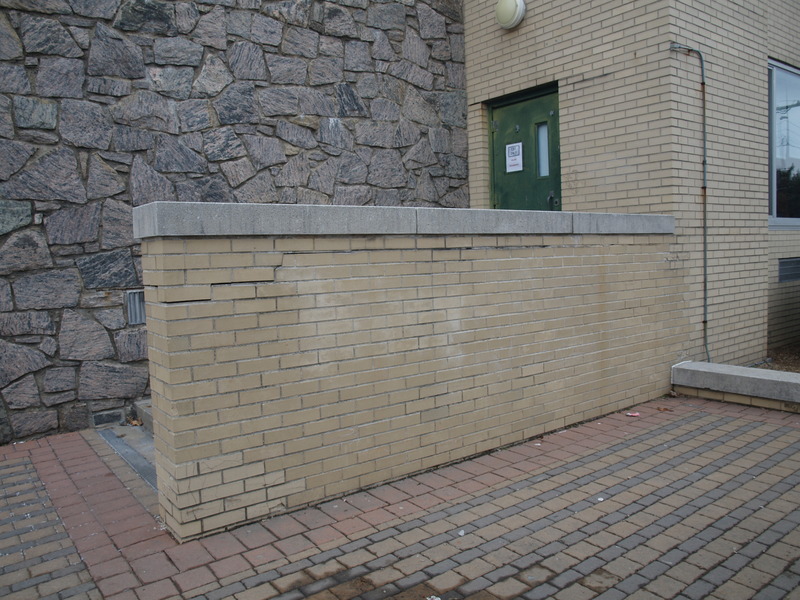 Masonry work was done by Wager Construction Company in the days before and after the Labor Day weekend in 2011. 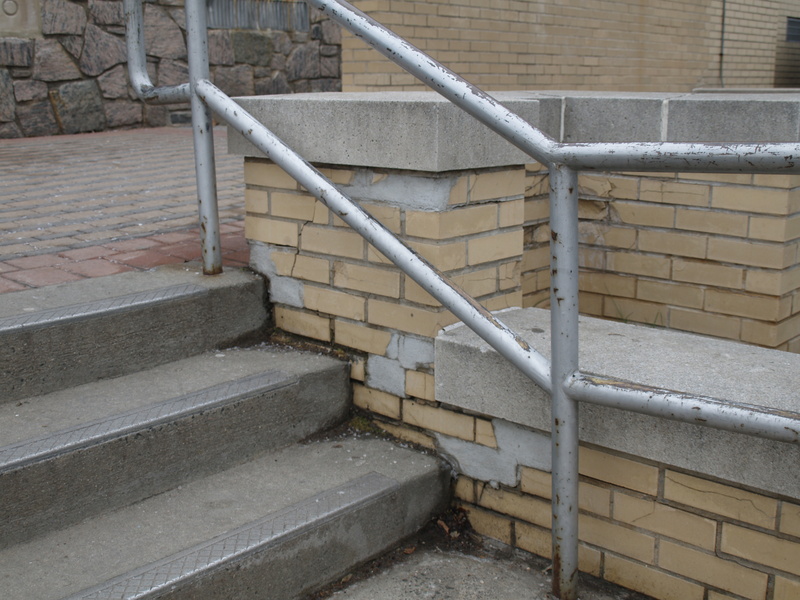 Wager currently holds a $275.000 contract with the District for masonry mechanics and sidewalk repair. District records for this job include a Purchase Order for 63 hours of labor for a Mason, and 5 hours from the supervisor, as well as over $2,000 for materials. Wager Construction Company submitted an invoice for $180 for mortar, $290 for blocks, $475 for yellow brick, $180 for concrete mix and a total of $625 for various items like caution tape, warning cones, tape and hand tools. At those prices, the District could have purchased more than two dozen 80 pound bags of mortar or over 2,000 pounds of mortar, 201 cement blocks, 380 yellow bricks, and 2400 pounds of cement mix. The purchase order states that the work to be done is to repair the side wall of the front entrance by the stairs. The work was to entail saw-cutting the coping stones and then replacing all the broken bricks with new, matching bricks. A visit to Columbus School revealed a relatively small amount of work was done on the wall. 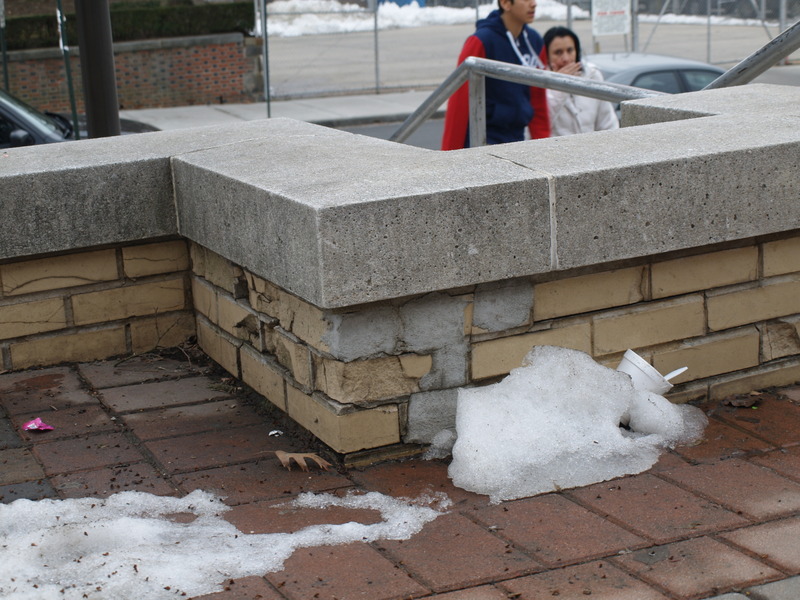 Inspection of the site this past week, showed no indications of any recent removal of the coping stones. There is one area where 22 bricks, slightly out of alignment and not matching the color of the original yellow bricks, appear to have been replaced. Please note the lower left corner for the 22 bricks that seem to have been replaced, please also note the horizontal crack above it coinciding with the length of where the wall integrity was compromised. There is one other area where 7 original bricks were smeared over with cement, and another area where 5 bricks were smeared over with cement. An experienced architect inspected the work at our request. His professional opinion is that the invoice and work performed do not match. He pointed out that the horizontal crack in the wall is a clear sign that the support of the wall was compromised when the 22 bricks were removed and replaced. The crack is a sign of sagging of the entire structure, which now is representing a much larger problem in regards to the integrity of that wall. In addition to the work itself, there are some questions about the related paperwork. The purchase order and the invoice have the same date. September 6th, 2011. Standard practice is for a contractor working under a Bid Award to submit a purchase order which is then approved after careful inspection by the approving head of the department. It is then sent down to purchasing to generate a Purchase Order. The work actually started on Aug 31st and it went through to September 9th 2011, according to district payroll documents. According to these same documents, one of the workers was paid as a laborer but charged to the district as a mason. Under the District Bid Awards, the contractor can charge us $70.00 per hour of laborer, and $75.00 for a mason. These labor charges are above NY State Department of Labor “prevailing wages” for the job categories. In addition, prevailing wage charges to municipalities include the mandatory extension of benefits to the worker. Auditing of actual pay-stubs will reveal if these workers are actually getting benefits, for which the contractor is charging the school district. The invoice states that the District was charged for materials including hand tools and “consumables”. Typically, tradespeople are expected to provide their own tools and while it is reasonable to charge for consumables such as saw blades there is no indication that any cutting was done. The District was charged for protection items such as plywood, caution tape, and cones. The amounts charged appear to be excessive. For example, $315.00 buys hundreds of yards of caution tape or over a dozen sheets of 4×8 plywood. On the payroll certification form, the contractor swears under oath that the information provided is accurate. The date on that form is November 29th 2011 — two months after the PO and Invoice — where the work is described as “Trinity Brick Pinting” (sic) and not “Columbus Brick Wall repair”. There are many questions about this job. Why was the purchase order created after the job started, and on the same the invoice was dated? Could it possibly take 63 hours for a mason to replace 22 bricks and smear cement over another 12? What was the need for a supervisor and why was this person only present for 5 hours? Why is the District agreeing to prevailing wage rates that appear to be above the actual prevailing wages in our area? The most pressing question is, where is the oversight? Was this work inspected? Why did nobody question these high material costs? Why did nobody question the labor rates? The hours charged? The miscellaneous supplies charged? The incorrect job description? Does anyone audit the payroll of contractors to make sure that benefits are in fact extended to the workers? So why is there no control? I would suggest that from now on, every job that is considered to be too large to be handled by our in-house masons, needs to be clearly documented. There should be photos of the damage, a detailed description on what needs to be done, what techniques to be used, what materials needed. This description as well as an estimate on time and material cost should be done by a licensed architect and should be reviewed by a chosen panel of qualified citizens with architectural, construction, project management and estimator background. This is tax money spent, and we as community have vested interest to spend this money as wisely as possible. New Rochelle is blessed with highly professional citizens and the CAC has shown that working together to keep things under control can bring great results.